The global forklift truck market is projected to reach US$ 23.81 billion by 2025, exhibiting a CAGR of 3.74% over the forecast period. Forklift trucks are used as industrial lifting trucks. These trucks are utilized to relocate goods from one place to another. Forklift trucks are mostly used in manufacturing and warehouse industries, as these industries involve relocation of heavy products in a short period of time, to accelerate the production process. Among product type, the counterbalance type forklift truck segment held the largest market share in 2016. The warehouse type segment is expected to exhibit a highest CAGR over forecast period. Among engine, the electrically powered segment accounted for a major market share in 2016, owing to the growing demand for electrically powered forklift trucks in emerging economies such as China, India, and Brazil. This segment is projected to be the fastest growing segment during the forecast period due to increasing focus on fuel efficiency and emission control. Among end-use industry, the retail and wholesale segment is projected to witness the highest CAGR over the forecast period. Due to improved transportation system, the trade barriers across the world have reduced, thus increasing the supply of goods in warehouses. Europe holds the largest market share for the retail and wholesale segment. Among lifting capacity, the under 5 ton capacity segment is expected to hold the major market share and is projected to exhibit a higher CAGR over the forecast period. The < 5 ton capacity forklift trucks are usually involve battery-electric forklifts. Demand for electrically powered forklift trucks are rapidly increasing due to their environment friendly nature. They are also relatively more silent while processing, easier to operate, and incur lesser operational & maintenance costs as compared to IC engine powered forklift trucks. The Class III type of forklift truck includes electric motor pedestrian trucks. This segment is projected to witness highest growth over the forecast period, owing to increasing demand for electric forklift truck in material handling departments and warehouses. This demand is driven by the environment friendly and cost-effective nature of these trucks. Asia-Pacific is expected to hold the largest market share due to high demand for forklift trucks in emerging economies such as China and India. The region accounted for 37.56% market share in 2016 and projected to exhibit a higher CAGR over the forecast period. European holds the second largest market share in the global forklift truck market, followed by North America. Growth in these regions are associated with high demand for electric powered vehicles and the growing warehouse segment. Germany accounts for the major market for forklift trucks in Europe. Major players operating in the global forklift truck market include Toyota Industries Corporation, Kion Group AG, Jungheinrich AG, and Hyster-Yale Materials Handling, Inc. The global forklift truck market was valued at US$ 17.74 billion in 2016 and is projected to exhibit a CAGR of 3.74% over the forecast period, reaching US$ 23.81 billion by 2025. Fork lift trucks are mainly used for material handling, lifting, and stacking of discrete loads throughout the facility. These vehicles can be used with a variety of attachments such as clamps, grippers, and platforms to move and handle different types of materials and loads. Expansion of the logistics industry and economic growth in emerging economies have led to increasing logistics volume, therefore boosting growth of the forklift trucks market. According to this report, one of the major growth drivers of the forklift market include increasing demand for these forklift trucks in the global e-commerce and warehouse sectors, increasing demand for global trade, growth in the container and shipping industry, and rampant globalization of supply chains. The global e-commerce market is expected to witness steady growth, exhibiting a CAGR of over 12% over the forecast period. 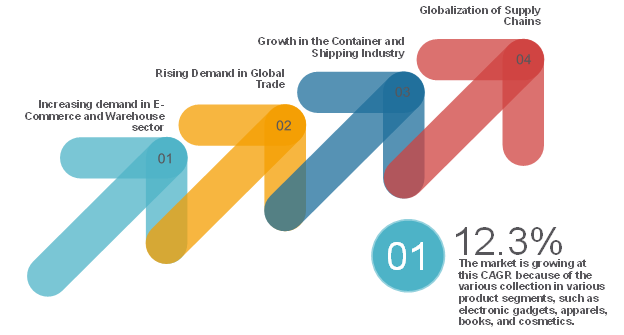 Growth of the e-commerce market is driven by diverse portfolio of product segments such as electronic gadgets, apparels, books, and cosmetics. However, high costs of battery-operated and fuel-cell forklift coupled with the growing environmental concerns regarding the use of IC-engine type forklift trucks are expected to hinder growth of the forklift market over the forecast period. Some of the major trends identified in the forklift truck market are increasing demand for battery-operated forklifts to reduce CO2 emission from IC engine powered trucks and increasing demand for automation in emerging economies. This report segments the global forklift truck market on the basis of product type, class, engine power, fuel type, end-use industry, lifting capacity, and geographical region. On the basis of product type, the global forklift market is segmented into warehouse and counterbalance. Warehouse segmented is further sub-segmented into pedestrian and rider. On the basis of class, the market is segmented into electric motor rider trucks, electric motor narrow aisle trucks, electric motor pedestrian trucks, internal combustion engine trucks (solid/cushion tires), electric and internal combustion engine tractors, and rough terrain. On the basis of engine, the market is segmented into IC engine and electric power engine. On the basis of fuel type, the market is segmented into diesel, gasoline& LPG/CNG, and electric/hybrid. On the basis of end-use industry, the market is segmented into Retail & Wholesale, transportation & logistics, Automotive and Electrical Engineering, Food Industry, and other industries (chemical, wooden, and paper & print industry). On the basis of geography, the forklift market is segmented into North America, Europe, Asia-Pacific, Latin America, and Middle East. Key companies covered as a part of this study include Toyota Industries Corporation, Kion Group AG, Jungheinrich AG, Hyster-Yale Materials Handling, Inc., Crown Equipment Corporation, Mitsubishi Nichiyu Forklift Co., Ltd., UniCarriers corp., Anhui Heli Co., Ltd., Komatsu Ltd., Clark Material Handling Company, Doosan Industrial Vehicle and Hangcha Group Co., Ltd.
*Browse all the market data tables and figures on "Global Forklift Truck Market - Global forecast to 2025”. *Browse 50 market data tables and 30 figures on "Forklift Truck Market - Global forecast to 2025”.